Prominent labor leader, Randi Weingarten, president of the American Federation of Teachers, AFL-CIO will be honored by The Suffolk Community College Foundation at its annual Salute to Excellence Gala. 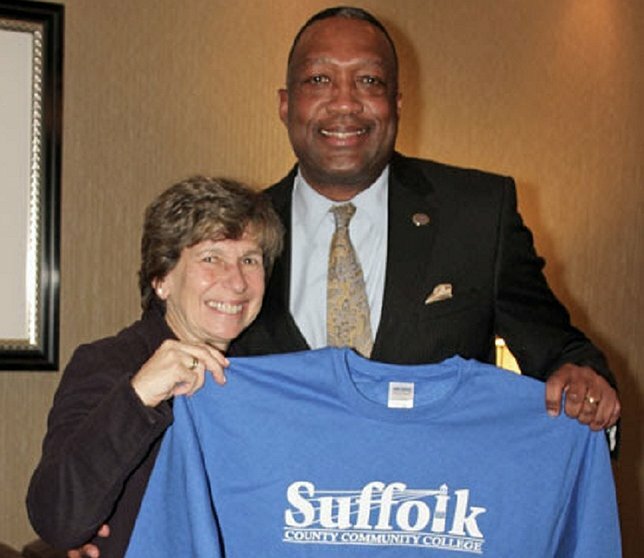 Suffolk County Community College President Dr. Shaun L. McKay visited with Randi Weingarten to discuss the upcoming gala. Selden, NY - February 23, 2017 - Prominent labor leader, Randi Weingarten, president of the American Federation of Teachers, AFL-CIO will be honored by The Suffolk Community College Foundation at its annual Salute to Excellence Gala whose proceeds will be used to fund need and merit-based scholarships, emergency student loans and quality academic enrichment programs. The Foundation distributed more than $650,000 in scholarships and aid last year. The Salute to Excellence Gala celebrating Weingarten and the college will be held on May 4 at the Hilton Long Island in Huntington. “We will celebrate and recognize a great labor leader whose advocacy for education and the middle class has helped advanced the most important engine in creating the American Dream and a better life for each generation,” said Suffolk County Community College President Dr. Shaun L. McKay. “The mission of the Foundation is to reduce the economic barriers to higher education and foster student success. The Salute to Excellence Gala is the College’s single largest event held annually to generate financial support, community awareness and most importantly make a difference in the lives of our students,” said Executive Director of the Suffolk Community College Foundation Dr. Sylvia A Diaz. The celebration will begin at 7 pm. Gala sponsorships, tickets and journal advertisements are available now through the Suffolk Community College Foundation website. SELECTIONS FROM THE 3RD ANNUAL NY DISABILITY FILM FESTIVALTO BE SHOWN AT ABILITIES! Subject: LongIsland.com - Your Name sent you Article details of "Distinguished Labor Leader & American Federation of Teachers President Randi Weingarten Honored by Suffolk Community College Foundation Annual Gala"